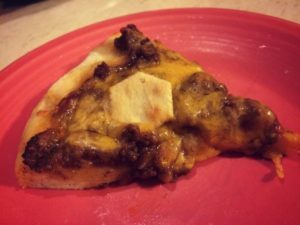 One of our favorite pizzas at home is Cincinnati Chili Pizza. 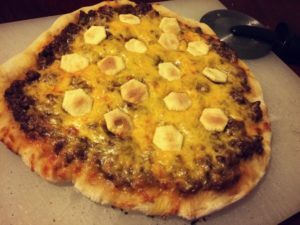 When Henry was born my cousins brought us several homemade pizzas for dinner and one was an epic Cincinnati Chili Pizza. It became an instant hit with our family and now we make it on a regular basis. Whenever I make some homemade Cincinnati style chili (recipe handed down from Michael’s grandfather) we always use the leftovers to make a pizza. It is so easy to make and there are almost never leftovers from it. Preheat the oven to 450°, with the pizza stone inside the oven to warm up. Spread the chili evenly on the crust. Sprinkle Shredded Cheddar over the chili. Bake for 10-20 minutes, until crust is golden brown and cheese is melted. When it is finished remove the pizza from the oven and put oyster crackers on top of the cheese, pushing them down a bit into the pizza. Add hot sauce if you need a little more heat!